Due to the popularity of the Blitz KR2, we have now upgraded this model to the KR3 that offers you a twin seat road legal buggy. The KR3 uses the very popular Fiat Seicento as the donor car and offers a very reliable and robust engine with over 45 mpg, with a top speed in excess of 110 mph (with 900cc engine), low road tax and fully comprehensive insurance from £125 makes this a great run around buggy. The KR3 is our latest road legal buggy to our range, and already has proven popular with order books filling up during the initial design stage. We are offering this car in kit form or factory built by Blitzworld, with several engine options available including custom builds, please call for details. The design for the KR3 is significantly different than the KR2 with more side and front impact protection. 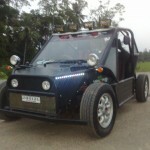 The buggy chassis is made in 3 parts; a nose crumple zone, the driver cage and the rear engine bay. Due to the multi engines available the KR3 has being designed to protect the driver in the event of a high-speed crash both on and off road. 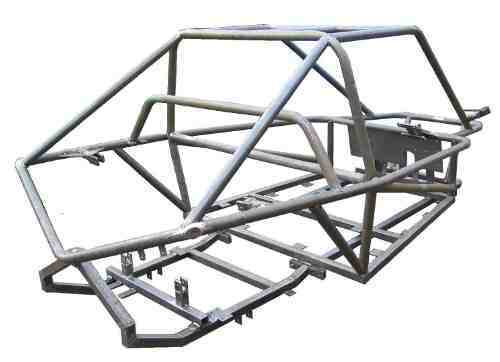 The roll cage is made from 1.25" NB CDS (cold drawn seamless) tube that is lightweight and very strong. 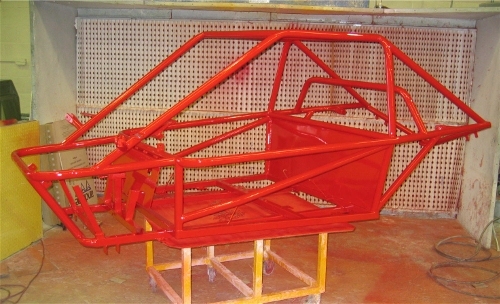 The base section is constructed from 40x40 box section forming a very strong chassis base. The engine sub frame complete with axels bolts directly onto the main chassis, offering a removable engine bay. The buggy also has a steel front bulkhead to mount the pedal box and brake servo and gives protection to the front mounted radiator. 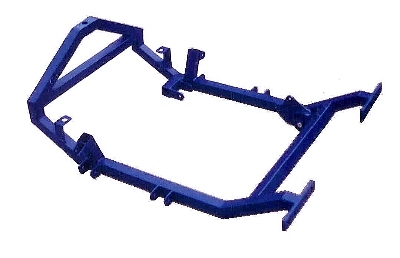 A rear firewall is fitted with horizontal tubular cross member for added driver safety and protection. The floor is made from aluminium checker plate and is stepped to raise the driving position, allowing large seats to be fitted with adjusting runners if required. The standard Fiat Seicento comes with a 900cc or 1100cc engine. The 900cc engine offers very low road tax and insurance with excellent MPG. The KR3 is also designed to take virtually any engine like the KR2 including bike engines that will fit into the removable rear sub frame making engine change and modification simple. 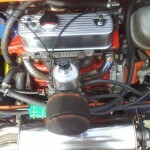 Other engines available for the KR3 include the popular Rover K-Series, including the 1.4, 1.6 and 1.8 VVC engine. The 1.8 litre VVC engine is capable of over 150mph, and insurance from as little as £150 fully comprehensive makes this one little buggy people will think twice about when it passes them on the road. We know you have all sorts of buggy-related fantasies. Who wouldn't want to use it to navigate hallways of cheap hotels or race on it on the freeway? 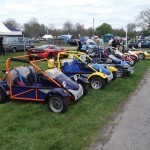 However, if you want to put your KR3 buggy on the road you will have to take the buggy to a local SVA centre, where you will be issued with the relevant documentation to put the buggy on the road and obtain a new number plate and chassis number. The Blitzworld chassis is made from CDS tube and comes complete with the detachable rear sub frame (please select engine to be used when ordering). 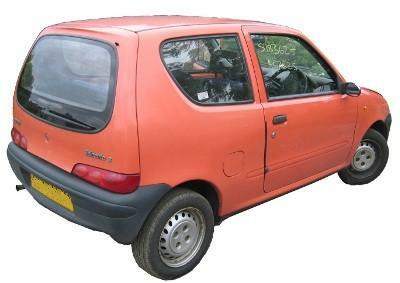 The Fiat Seicento is a very popular car and can be picked up for as little as £200 (accident damaged). See Auto trader and ebay are good places to look for donor cars. The following list is all the parts you require from the donor car. · 2nd set of front hubs, lower arms, typical cost £40 from scrap yard. With the KR3 chassis you will also need other parts not available form the donor car, these include; suspension, cables, front facer and petrol tank etc. We have put together 4 different assemblies to build the KR3 for On or Off road use. 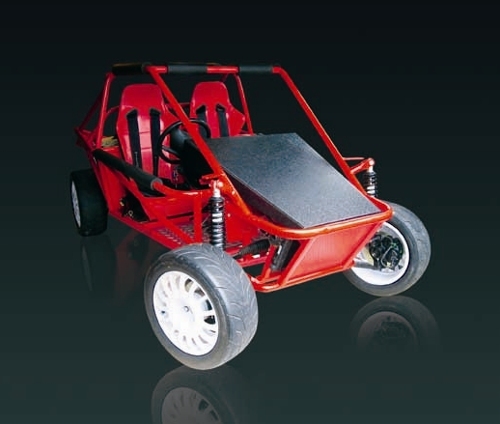 This is designed for the competent kit car builder who makes / source own parts, e.g. petrol tank / exhaust etc. This is for the first time Kit Car builder and consists of all the parts required to build the KR3 buggy for off road use. This is for the first time Kit Car builder and consists of all the parts required to build the KR3 buggy for on and off road use. This is the show car kit and has all the parts as featured on the show car. Blitzworld offer a factory finish two pack painting of your chassis so that you can have your chassis delivered in the colour / colours of your choice, including metallic paint. The off road standard KR3 buggy built by Blitzworld is ready to drive away with all donor parts cleaned painted, replaced / repaired as required. The donor wheels are used, but mud and snow tyres can be fitted at a later date if required.